We offer a range of reasonably priced half day workshops, specifically designed for the needs of Small Museums. 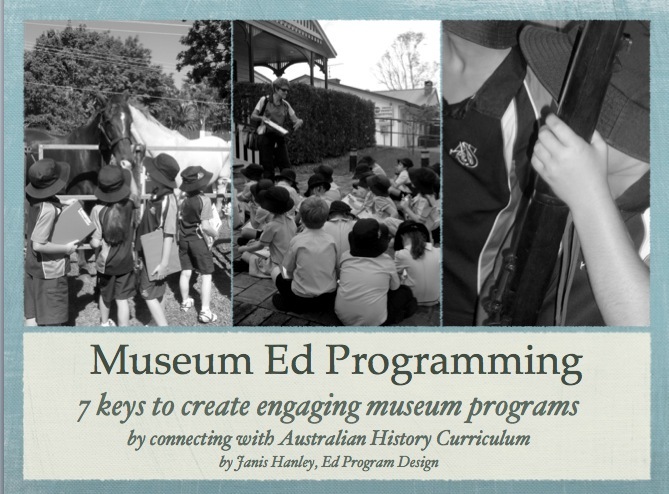 These workshops are deigned to assist museum volunteers to put together their own engaging museum education programs for schools. They are an ideal way to bring your museum volunteers together to collaborate on creating great education programs. Half day workshops are , conducted at your museum. Extra charges may apply for museums outside Brisbane or Gold Coast areas. You might like to ‘buddy up’ with other nearby museums for the workshop. Perhaps you are wondering about the Australian History Curriculum, and are uncertain how our museum can make the most of it to attract schools. This workshop provides a starting point. It gives an overview of the techniques and activities to engage kids. It includes an overview of the Australian History Curriculum for each year level from prep through to year 10. Want to know how to reaching out to schools with engaging education programs? By the end of this workshop you will have a clear strategy for your museum programs – its activities and getting it out there. This walks through a series of exercises to hone in on the key elements of an education Program for your museum. It looks at the content and year levels that your museum can focusing on, and ways to have schools knowing at your door. This workshop hones in on an excursion for a year level of your choice. Together we go through the logistics of groups of students on your site, and the activities that will draw students in and engage them in your collection. There’s no one size fits all, but there are strategies that work for specific situations. You might already have a program in place, and would like to ‘tweak’ it. Together we look at what might be the best fit for your museum, given your collection, volunteers available and constrains of the museum site itself. Tablets and iPads are becoming the norm in mosts schools. Museums are terrific places for students to explore collections from the perspective of a film maker. This program is based on the History in Place program by the History Teachers Association of Victoria and expands it further. The students are tuned into the technology – the museum just needs to show them the rich ground for creating video clips about your museum’s stories.